Gas + **** hotel room in the Westin Harbour Castle + ticket to see Nine Inch Nails, Queens of the Stone Age, and Death From Above 1979 in Toronto = $83. Nails' set was brilliant. They sounded deliciously crisp yet wielded the raw energy of an atom bomb. The new lineup played like pros, with Aaron North on guitar, Allesandro Cortini on keyboards, Alex Carapetis on drums and Jeordie "Twiggy" White on bass. North in particular was aflame, frenetically twisting and flinging his guitar while never missing a note of his scabrous solos. True to NIN form, he busted his guitar into kindling at the end of the set. The arrangements on many of the songs were altered; "The Only Time" was appropriated during the bridge of "Closer," which fit surprisingly well in stripping the song down to an even more danceable beat. 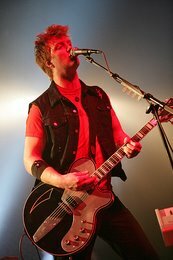 "Burn" was especially altered, the textural layers were stripped down during the verses to make the song less abrasive. Should a bootleg surface, I demand a copy. Every song sounded at least a bit tweaked from the studio version. The results were gorgeous. 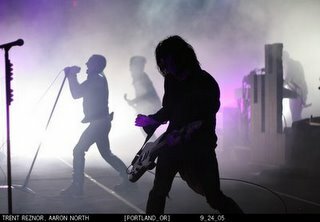 NIN's set was also visually brilliant. During "Eraser," they returned to using the projection screen in front of the band, against which they displayed a video montage of the evolution of life on Earth (which naturally concluded with images of the war in Iraq and thus begging the question, how long does life on Earth have left?). The screen's viscous imagery during "Beside You in Time" made the band look like they were playing in an aquarium. And, lo and behold, the image of Bush onscreen during "Right Where it Belongs" received a suppressed chorus of 'boos.' I think the Canadian citizenry has grown largely indifferent to his violent sham of an administration. Queens' set was a bit disappointing; I really, REALLY didn't like their set choices (omitting "Go With the Flow," "Someone's in the Wolf," and "Monsters in the Parasol"). Homme was his usual strutting awesomeness and the new bassist was a tremendous asset on backup vocals. DFA 1979 really rocked it out, but no one really cared. DFA 1979 set list: pretty much every song from "You're a Woman, I'm a Machine."